We are prominent natural Iron Ore mineral trading and marketing company. Tidy Mart have extensive relationships with leading mine owners in Indonesia, India, Brazil and Chile. 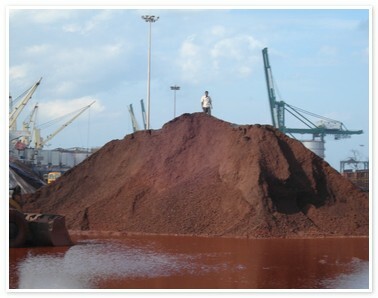 We organise and supply the following grades of Iron Ore fines as per your requirements. The Iron ore fines grades as follows, Fe45%, Fe 55%, Fe 58%, Fe 59%, Fe63.5% and Fe65; exclusive these we are exporting big volume of Iron Ore grade of 63.5% rejection below 62.5%. Tidy Mart impact Quantity and Quality by SGS or equivalent, at seller`s cost at loading port, this will be protected by 2% performance bond (PB). Tidy Mart formed consortium with mine owners, traders and exporters and acknowledged expertise in this Iron Ore Industry. So we are promising that we can fulfill our client's needs. At Tidy Mart the goal is to fulfill our Client's requirements. Shipments on FOB & CNF basis ranging from grades of Fe54% to Fe65% Shipments are through Safe Ports. Size from 10mm: 10% max. Delivery starts 90 days after opening the SBLC and DLC. The shipment will be arranged by the Tidy Mart for delivery of Commodity within 50 days after the receipt of an Acceptable Payment Instrument from the Buyer. Tidy Mart will specify the Shipment Date after SBLC and DLC is confirmed to be operated for payment into Seller's Bank Account. Seller sends FCO/ Seller send draft contract to buyer with seller profile & other document. Buyer Check on the spot in the stockpile and stock room, if required. Tidy Mart attached an LOI & ICPO form for Iron Ore buying, for Buyer's convince. Tidy Mart's clients are requesting to download these forms and print on LC issuer letter head and send it to our business mail ID. Buyers name, Address, Phone number, Fax number, Email address must be included, Tidy Mart's clients can download the LOI or ICPO from the following link. Tidy Mart provided sample FCO, for Buyer's convince. All our buyers are requested to download the FCO from the following link can be used only for sample purpose and for clarification. Further if you have any inquires related to Iron Ore Fines import from Tidy Mart, kindly mail us with your entire queries. We are here to assist you in every possible way for mutual beneficial. Tidy Mart is one of the leading Market for all region Iron Ore Fines. © 2004 - 2011 : Tidy Mart, All rights reserved.